I mentioned that I was much taken by the down-to-earth faces which look down from the masonry at St Cross Hospital, Winchester. I also let slip that there was one notable exception to those which simply made one feel comfortable. I walked through the arch under the gatehouse and her eyes were upon me; so much so that I felt compelled to turn and meet her gaze. She was no mediaeval grotesque, and no Renaissance gargoyle. She appeared to be relatively recent, though her son has not worn so well. She has the magnetism of the Mona Lisa, but the enigmatic smile is missing. Instead, there is something steely about this madonna. One would not choose to cross her. I did not ask after her that day, and have drawn a blank on her since. My guess? 19th century. Pre-Raphaelite, even. Whatever she is, wherever she came from, I find her rather disturbing. Because she looks alive, though she is grey. That gaze could lock you, standing there beneath. She is a formidable figure. Posted in Uncategorized, WhimsyTagged england, history, St Cross Hospital, WinchesterBookmark the permalink. Hmm, I see what you mean. Maybe something has taken up residence within? What a cool story that would be, Bia! Almost Poe-worthy methinks! lol. Will you do it or shall I? ‘Forbidding’ is the description that springs to my mind. I too find this glance daunting, but it could be due to the angle a pedestrian sees her from. Up at her level she may still be looking down but there might at least be the faint glimmer of a smile that we can’t see. 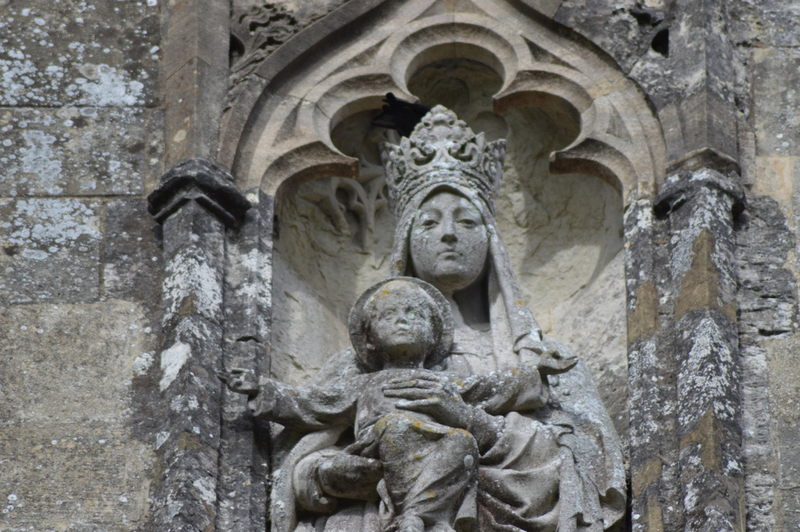 Or, if St Cross is High Church (which I suspect is so) then her cold look could be a reference to the Catholic concept of Mater Dolorosa, where the BVM (despite holding the Saviour King in her arms) is aware of Jesus’ death and of the sins of mankind that brought him there. The Seven Sorrows of Mary they’re called, a medieval devotion that’s still popular with devout Catholics now. And particularly apt considering the Hospital’s dedication to the cross. As a counterbalance to all this negativity, there’s a more upbeat English folksong you may know called The Seven Joys of Mary (http://www.8notes.com/digital_tradition/SEVNJOYS.asp, though this isn’t the version of the tune I remember). I’ve sung the mixed choir version of the Britten with harp, but this version is lovelier — and the boys choir original even more so. Beautiful photos too. Clear as day, isn’t it, Tammy! I agree. Most arresting. I must find out her background. Dying to find out who the artist was. That Madonna is not particularly friendly looking. Very interesting, but definitely not friendly. No. Her eyes follow you wherever you are in the quadrangle. Most unsettling. I think she’s stunning. A beautiful, strong, determined woman. She is that, PT. But like many beautiful, strong, determined women, a bit scary. I haven’t been aware of such elaborate crowns on many of the Madonnas. It appears to be very large and is certainly intricate, accentuating the title “Queen of Heaven.” I see kind of a noble and austere expression that I associate with royalty, but I do prefer more “maternal” madonnas. One thing for sure, she demanded attention and was was following you with her eyes. I wonder if she could read your mind? She looks a bit cross . . . perhaps that’s why they chose her for St. Cross? I think she looks very determined, Kate. Many a mother has that look from time to time. I would not mess with her, that’s for sure. A reluctant Madonna perhaps? She is beautiful though. Wonder who she was modeled after! A commanding presence. Imperious, and unlikely to suffer fools gladly. She makes sense to me… One would have to be made of stern stuff to mother such a man, to bear witness to such a life in one’s child. Whether divine or not, she must have been a force to be reckoned with in her way. Why not allow her to look that way?